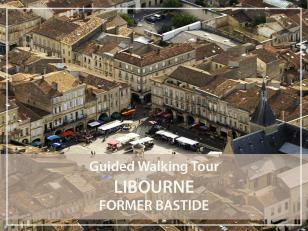 Guided walking Tour : Libourne, former "Bastide"
A guided walking tour through Libourne, an former "bastide town" and former Bordeaux's goddaughter. Our Libourne guided tour will be an opportunity to evoke the importance of trade with the hinterland, the wine trade and the history of the bastides. Why taking the time to visit Libourne? Certainly, its neighbour Saint-Emilion bears a famous name but Libourne remains no less interesting! Libourne is an former bastide founded in the 13th century by Roger de Leyburn (or Leybourne) in the name of the King of England. The city has developed at the confluence of Isle and Dordogne, in the centre of a rich wine-growing region. This confluence has given it great economic importance throughout its history, making Libourne an economic centre where biesn and hinterland goods were traded and others coming from all over Europe that returned inland via the Dordogne. For a long time, it was the second largest city in northern Guyenne after Bordeaux, the capital of Aquitaine, and it sometimes competed with Bordeaux in terms of trade and taxation. An important garrison town until recently, a wine trading centre and an active port until the development of the railway, Libourne has a varied monumental heritage. Today the local population reaches almost 25,000 inhabitants. Our visit will also take us to the Musée des Beaux-Arts (except Sunday, Monday and Tuesday morning). You will be able to discover a very interesting permanent collection, often little-known locally : paintings signed Manfredi or Bassano, Dufy and an original collection of enamelled glasses signed Giboin or beautiful English alabasters dating back to the 14th century. Tuesdays, Fridays and Sundays - The market was voted the "most beautiful market of the Gironde" in 2018.